There are three species of Australian pine (Casuarina spp) that have been imported into Florida for various purposes. They were widely planted to soak up the "swamps" in Florida, stabilize canals, and hold beaches. Unfortunately for Florida's ecosystems, the "pines" accomplished all this and more--like seeding prolifically, growing five feet or more per year, producing dense shade, and emitting an herbicide that kills most any other plant that has the nerve to grow within their collective drip lines. They have root nodules, like a legume, that fix nitrogen in poor soils for use as their own fertilizer, and they can tolerate saltiness. Between 1993 and 2005 the populations in Florida quadrupled. What a successful plant! Why is their success so bad for Florida? Because the sterile monoculture they form has replaced the normal ecosystem of plants and animals that used to inhabit beaches and many other areas. Our loggerhead turtles, green sea turtles and American crocodiles have lost nesting sites on sandy beaches above the high tide line where "pines" have colonized. Farther inland the "pines" have displaced marsh rabbits, gopher tortoises, and many bird species that depend upon the native plants that were out-competed. Australian pines caused significant damage in our recent hurricanes. Fast growth makes their wood brittle and they break under pressure. The shallow root system makes them susceptible to uprooting, too. They are highly flammable. So even if you ignored the environmental problems with this tree, it's not a good addition to a stormwise or firewise landscape. Australian pines are on the Category I list of the most invasive plants according to the Florida Exotic Pest Plant Council (www.fleppc.org); and the Florida Department of Environmental Protection prohibits possession, collection, transportation, cultivation, and importation of these invaders. 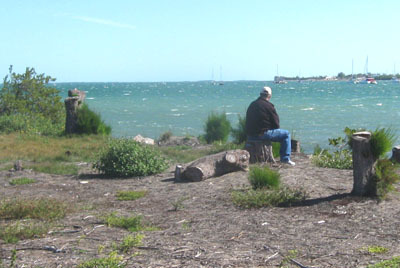 Even so, several years ago there was a group of Australian pine defenders in Key West. These folks appealed to the local and state governments to prevent removal of these invaders along the beach in Ft. Zachary Taylor State Park. They wrote poems and dramatic essays saying that the "pines" are part of their history and that they love hearing the wind whistle through their needles. I guess they don't remember stepping on those hard, pointy seedpods that are hazardous to bare feet. Their pleas were successful and these invasives are still there today. and have littered the ground with their spiny seedpods. Ouch! of their native plantings. Fighting invasives is a long term project! The military has been working to get rid of Australian pines and other invasives growing on its bases. On the Key West Naval Air Station, a multi-year program to eradicate invasives has begun, but it's not an easy task. The first step is to cut down the trees, but then all of the sprouts from the trunks and roots need to be eliminated. It's a huge job. been chopped down, but now the "pines" have sprouted vigorously and will need to be removed again. Native mangrove and seagrapes have been left alone, so maybe they'll have more of a chance to thrive. This area has been further treated and the Australian pine stumps appear to be dead. The Australian pine is just one of the 140 invasives here in Florida. While controlling invasive plants is a huge task, if we all do what we can to eradicate these aliens, it will make a difference. If any are growing on your property or on community property near you, do what you can to remove them. If you see invasive plants being sold in big box stores or other nurseries, complain. Replacing aliens with locally native plants that are adapted to Florida's environment will help restore some diversity for the sake of our birds, butterflies, and other wildlife. This post is part of FNPS's participation in the nationwide "Invasive Awareness Week" from Feb 26th to Mar 5th. Tell us what you've been doing to help eliminate invasives. Thanks. So what to do with all those stumps?? Sit on them! I guess the Navy doesn't respond to poetry when there's a job to do! Good for them and yes, I'd rather be on their beach rather than the dark, closed-in beach in the state park. What a contrast. This is an interesting article...except for the uniquely uniformed opinion about our Key West Australian pines and the purpose they serve at Ft Zachary Taylor State Park. Specifically, that is protection. —They buffer the island from storms, including hurricanes. In 2005, hurricane Wilma hit our island. The storm came in from the pines side of the island. Much other vegetation gave way or later withered and died. The pines held. —They hold the beach in place. The extensive roots of the pines keeps the better parcel of the beach from washing away while the shoreline must be constantly replenished. —They give us shade. This cannot be undervalued. In the intense and relentless heat and brightness of the Key West sun, the pines provide respite. Possibly above all, this was the reason our community banded together to defend these pines. The price of a pair of flip-flops to protect the bottom of our feet from the small "pine cones" that the trees do rain upon the otherwise soft needles that do cover the ground is a fair exchange for the cool shade the tall trees provide the beach. How the many picnic tables and grills are situated is indicative of the popularity and value of the pines; none out in the sun, they are all beneath the shade. Of course, poems and songs and art was created in support of the pines. This IS Key West and the pines ARE great. Come see for yourself! Mike, You and your friends are part of the problem. This invasive plant has cost millions, if not billions, of dollars to eradicate. It's unlikely that I can change your mind, but consider what you've done to harm wild areas and wildlife with this rogue stand of noxious weed trees as stated in the post. I live in River Bridge, Greenacres Fl, 33401. Is there a law by the state to remove the Australin Pines in our neighborhood. I want them gone but the POA says there is no law stating there removal in this area, therefore live with it. Can you help me? 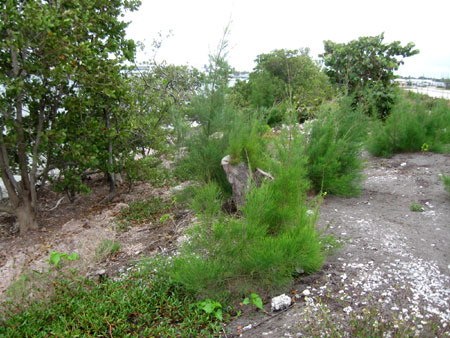 Although you must remove Australian pines from a new site before you are issued a building permit, the law in Palm Beach County right now only mandates removal of existing trees if they are within 500 feet of a Natural Area. Unfortunately there is no money available to help homeowners with removal. 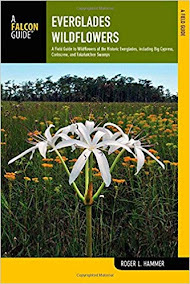 Thank you for your effort, it IS IMPORTANT to rid FLA of this invasive plant. Ginny, I wonder if you can give any information on how to improve soil quality once these trees are removed. I have some land in the Bahamas, and we are in the process of removing the stumps and the last of the fallen needles, but how long does the plant's influence last after it is gone? Any help would be greatly appreciated! Thanks! Emilia Arrington: Just refoliate with a ton of natives, it will recover quickly. Jorge Fernandez: That is what I think also. Plant plenty of natives flowers, grasses and trees and the entire environment will recover. If you are too concerned about the quality of the soil you can use the best of your local gardening potting soils for the flowers. 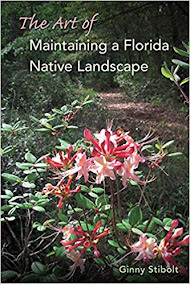 Florida Native Plant Society: This is a legitimate concern because these invasive trees, especially the roots, are allelopathic to other plants. Are there some plants that do well in the aftermath of the Autralian pines (Casuarina spp.)? Barbara Powell Harris: Look around at the sites in the area where plants are re-establishing where the Australian Pines have been removed. Plant these plants and let them establish. You can always remove the ones that you've planted once they have removed some of the allelopathic properties left in the soil. Wish I had time to take a drive out to a beach area that has been replanted with natives and make a list. Rhoda Floyd: http://www.pinellascounty.org/scienceforum/pdf/Removal_Australian_Pine.pdf This indicates that they replanted after removal of the pines, and that what they planted did well, so the toxins put out by the Australian pines might not last long. Another article that I read indicates that removal of the leaf litter is advisable. Good luck. You can check out future comments at https://www.facebook.com/FNPSfans You don't need to be on Facebook to look at our page. I hope this is helpful to you and anyone else who may be restoring such a habitat. The regulation against growing Australian pines in Florida is way out of bounds. I own 6 acres and if I want to grow an Australian pine, it won't hurt my neighbors or the state. I think it is ridiculous that parks, etc. cut down the only beautiful and real shade trees we have in central and south Florida. 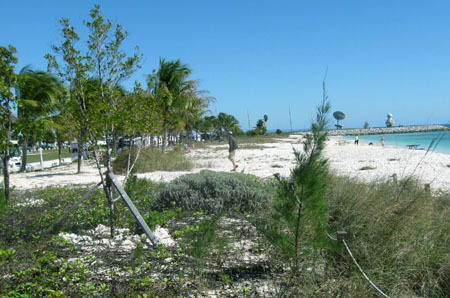 Rather than hurting the beach at Zachary Park in Key West, it enhances it. If you have to attack a tree, go after the strange looking euchalyptus type trees growing all over south Florida. I don't know why it's been my luck to have these trees on TWO of my Florida properties. My first home and now my second. They are the worst. I can't believe that guy would defend having them! He has NEVER had to deal with them, I would guess. They do NOT provide good shade, they take over and multiply and make the ground so yucky, full of roots and more trees. I work every year to keep them in a small area but its tough. If I lived near that beach #FtZacharyTaylorStatePark I would have helped get rid of these nasty #AustralianPines then planted a nice pine. The right Pine tree would grow so fast and are they are much much prettier. Is it safe/legal to mulch Australian Pines? If so should it be done before they seed? AGREED! Thank you for your insightful post. Here's a better idea. If you aren't a Florida native, leave now! Your presence has cost us millions in the way of higher taxes because we have to add more services we don't really need to make you more comfortable, as well as make our state like the one you left! Please go home! If the Austrailian Pines have to go, then you should as well! Yea, get a life! You want them gone? really? what have they done to you? Well said! I agree. I have hem on my property and they are beautiful! I love Australian Pines. Properly managed, they are a beautiful addition to Florida's coasts. They are here to stay, so people need to get used to them. Um, no. The only proper management of Australian Pines is removal. Period. They displace natives and have no natural predators to keep them in check. In Australia it's another story all together. Here they continue to be a nuisance that should not be embraced. Can anyone give us a reliable method to remove them? I have a couple large trees on my property and many shoots from the roots. I can cut them down but is there a herbicide appropriate for the stumps etc. As I understand it.>The trees were first introduced by early sailors. Their tall straight wood was great for making mast and yardarms. Now the beaches are being rid of this interloper. Im sure the environmentalists are happy, but if you decide to visit the beach (say, Boca Grande...) make sure you bring your own shade. These trees were part of my upbringing. They used to help hold the beach together and give us shade in the hot summer, make a beach trip bearable. RIP Austrailian pines, you will be missed. What is the alternative? You say grow natives instead. What tree grows in salty air by the sea? Wow, Mike, what an uninformed post. That stand of Casuarina did not protect anything. To say it protected Key West is simply laughable. There's a group of native plants across the way that fared better. Much more diverse and prettier than that ratty monoculture. How some ignorant group of people was able to overcome state and federal regulations I will never know because the park rangers told me they are not allowed to talk about it, when I was just a curious visitor wondering why a large stand of invasive was allowed at a state park. I was just a tourist at the time.. I guess your little group is able to stifle free speech too. Those 'pines' (they are not) are not known for durability, and they impoverish the local environment, stifling diversity. You're all for diversity, aren't you? Thank you Ginny, for a sane response. Peggy, It depends on where you live. In South Florida, beach species could include Sea Grape, Jamaican Caper, Bay Cedar and Buttonwood are good alternatives to Casuarina (Australian-pine). 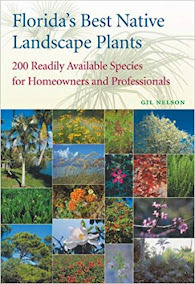 All of these species are readily available at tree nurseries that specialize in native plants. 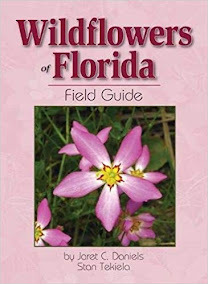 Visit www.afnn.org for a list of native plant nurseries in Florida. 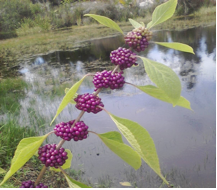 One can visit our many parks and natural areas and observe the native plants that occur there. It is important to determine what conditions one has in their landscape. Is tidal or storm surge an issue? Then you may want to plant buttonwood or mangrove species, if it is merely salt wind, then you have a much larger pallet to select from. It should be noted that Australian pine is not well adapted for long term salt water inundation. I am unaware that Australian pine was used for ship building. The wood is terribly heavy, dense, and brittle, and generally used only for rough cuts. Australian pine likely was introduced originally as a source of fuel. Most folks in poorer nations still use wood as fuel for cooking. 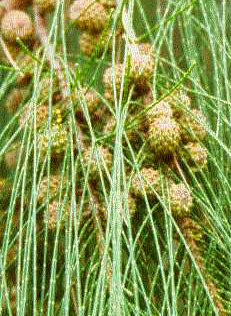 Casuarina spp. (Australian-pine), and in these poor nations, Casuarina is still grown for this purpose. It is a superfast grower, and trees become large in a short period of time. 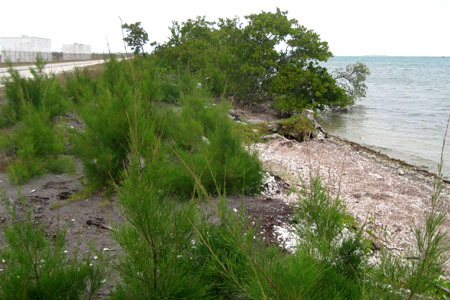 In Florida, it has been used as wind breaks, but other species are more suitable now given the invasive nature of Casuarina. In addition, Casuarina doesn't really stabilize the soil very well. Just walk down the beaches where it occurs, and you will almost always see trees with roots that our exposed. I do understand folks' attachment to a "sense of place", but realize that Casuarina has been commonly cultivated for only the last 60 years or so. If you watch old black and white episodes of Flipper, you will see mostly small Casuarinas in the background (invading our beaches), and that show was mostly filmed in and around Miami and Biscayne Bay. 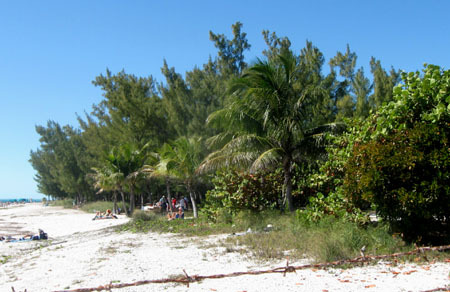 Soon after, Casuarina began to dominate coastal areas of South Florida including southern portions of Key Biscayne at Bill Baggs State Park. I too remember going to the beach there as a child. I recall the Casuarina forest as being a bit spooky in that nothing grew beneath these large trees, and there were dense mats of their needle-like leaves. Very little wildlife occupied these dense stands, there were no bird songs. I also remember cursing the trees' fruits as walking barefoot in a Casurina stand is unpleasant due to their sharp prickly fruit. 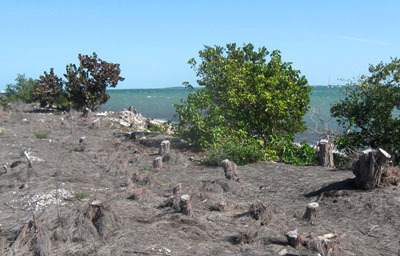 When Hurricane Andrew hit in 1992, there was major devastation to this tree stand on the Key Biscayne. Fortunately, biologists and habitat restorationists took advantage of this, and eradicated the last remaining Casuarina trees and began replanting the area with more suitable native trees. It looks beautiful today, is full of wildlife, and acts as an important respite for migratory birds who now have plants they are capable of feeding from. Folks who visit the park enjoy this "new" sense of place, which is actually the original sense of place. While I agree that the Casuarina offered no protection from Wilma, they do provide protection from the sun for beach goers at Fort Zach. That's a rare blessing on a Florida beach. I would not defend or protect an Australian pine in most places, and I agree that they are ratty looking, but I love them at Fort Zach and am glad the battle was won in their favor in this instance. I have lived in fla all my life. I have seen the devastating effects of hurricanes.The australian protector pine has always pulled through while protecting all the plants to leeward.I have seen many birds nest in them, and many smaller animals use them for a home..Most of the biggest tree have been here for 50 plus years.The state bird is called the mocking bird. 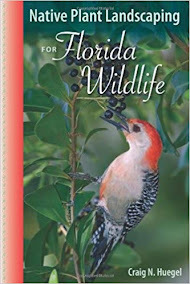 Because of its ability to mimic other visiting birds.What an appropiet name for bird as we the residents of florida hear so many dialects from visitors and residents from around the world.Our state bird is able to adapt ,communicate and exist with non-natives.Why cant we? 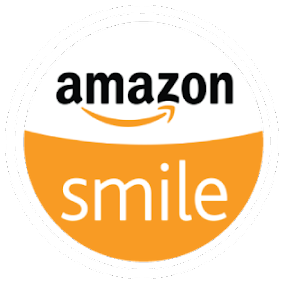 Thank you for your thoughtful post! The wind brought a seedling to my berm... and now I have a beautiful, swaying tree that offers privacy & shade! I also like that the weeds don't grow around it so that's a plus for me!. Always an admirer of this tree, I feel blessed that one chose my berm to flourish on! It blows my mind that there are these militant attitudes towards such grand, majestic trees. Who the hell cares if they're "not native"? Shoot, people are "not native" to these lands as well. I go to Ft. Desoto Park and some of these scrubby "native" trees are the ugliest trees around. It's a freakin tree in the end that provides shade and shelter. What's the problem with a little bit of variety? It's hard to believe that people actually devote effort and resources to cut these trees down. Who are these geniuses that made the decision anyway? Go find some other problem to solve, like cutting down confederate flags!!! - Each layer of the food chain depends on the one below it for survival... native insects need native plants to survive, native birds and mammals need native insects and native plants to survive, etc. 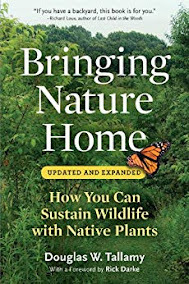 Native plants evolved with native wildlife, so everything from the shape and structure of the flowers to the chemical content of the leaves is tailored to the feeding habits of native insects, birds, and animals. If native plants disappear, so will native wildlife. I hope that gives you a clearer picture of why issues like native and non-native are incredibly important, and not something frivolous that botanists have dreamed up. I think they are kind of a pretty, wispy tree myself, but I love weeds too. (and eat them regularly!) I do understand the issues but I just honestly believe that in time, all natural systems will stabilize, regardless of point of origin of the flora and fauna. 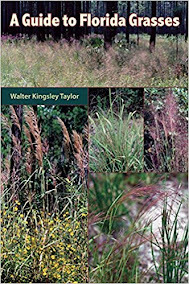 Considering the diversity of non-native plants in every environ these days because of the nature of our rampant wanderings, it is the aggressive survivors that always get the bad rap because of their blatant obviousness, not the little cute flowering plants...which eventually become endemic without much notice. Nature is the great equalizer, systems WILL evolve in time to take advantage of the new niches and balance will be restored. Different, yes, bad...that is a human judgement. All of earth started as a blank slate, and even now, new islands are populated by the fittest and strongest and the environment evolves and stabilizes accordingly, as it has done since the beginning of time. Humans are control freaks who think they have all the answers, but nature knows far better than any of us, and will prevail despite us. Those who feel the need to control should spend their efforts leaving a lighter footprint and stop being rabid consumers, and eat plants instead of animals...the main cause of pollution and environmental degradation and deforestation! Not only will you be doing the earth a huge favor, but you'll feel wonderful when you stop eating death, get back your health, and live in peace with the natural world. Wow, so you'be been able to track your ancestry so far back to call yourself a true Florida native? Even before the country was founded? Your ancestors were not immigrants at any point? That's AMAZING. we have a huge stand of these trees here in Brevard. it will probably cost thousands to have the tallest trees removed. we have a dead zone of needles covering the ground. My question, how quickly can we mulch or compost the needles? how quickly do the cut logs breakdown? any suggestions for speeding the composting? or does it all need to be hauled away? My preference is to compost all of it on site if possible. If we are vigilant about removing these trees and hundreds of suckers, how many years required before its eradicated? is one time application of herbicide recommended? thanks! I bought my house March of this year and thought what beautiful trees, little did I know. I have 22 of those beautiful trees and my first week in the house we had a mild thunderstorm, a broken limb, a fire when the limb hit the electric wires and a power outage. So my question is,what is the best herbicide to kill the root system? I have already started cutting,11 have been topped and limbs removed. I can cut and grind all day long but that still leaves the root! On the dunes of Boca Grande, it seems that Sea Grapes, which are identified as a native Florida species, also create a monoculture in dune settings if left to proliferate. Nothing else seems to grow there once they crowd out the other species. On the other side of a beach access bridge, there are no sea grapes and many diverse species of grasses, animals such as gopher turtles, etc live in established dunes.I know this is off the Australian Pine topic, but I think this is really about the negative impact of monocultures, whether native or non-native.